Now under LSJL(right click and click view image to see whole slide), we saw tiny dots in white(top middle) almost floating down into the growth plate(possible signs of stem cell recruitment). In contrast to epiphyseal distraction, the hypertrophic zone is denser than normal under LSJL where epiphyseal distraction decreases density in all areas. So Lateral Joint Loading has an effect beyond a stretching of the growth plate. The study containing the slides of the growth plates under GH can be found here on page 4. The study is password protected so I was not able to copy the slides. 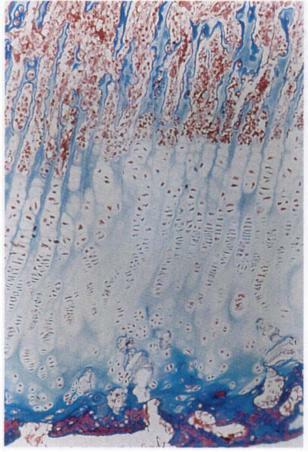 On slide A you can see at the top of the growth plate there is a thin blue line that is the same texture as the hyaline cartilage outside the bone. Since the external blue cartilage remains as articular cartilage it is logical that the blue line of hyaline resting zone cartilage remains. Comparing slides C and D, the growth plate is much larger. In contrast to epiphyseal distraction, the resting thick blue hyaline cartilage growth plate line is not bigger. Under HGH, in contrast to LSJL, the bone quality below doesn't change. Under LSJL the bone below looking more like compact bone must be due to other factors than increasing growth rate. Otherwise the bone under LSJL is very similar to bone under HGH. i mean no offense..but are the subjects in epiphyseal distraction rats or humans? cos apparently, the subjects in LSJL are rats. If they are different, this may explain the differences in characteristics as shown in the slides. All the subjects are rats. Whether rats or humans isn't an issue as we are taking about the biological function of the bone. Definitely Tyler has hit upon something that can be a wonder in the height increasing area. I've been doing LSJL for about 2 weeks now and believe that my tibia has increased by about 1-2 cm. Growing taller definitely will not be an overnight process. how old are you phil? what is your routine like? Hey Tyler! From what I can see on your blog LSJL could really promote bone formation. And with some hgh the results could be maximized.I am an athlete so I won't have any problem with that. I would like to start LSJL but I need to know how much hight did you get from LSJL, because there are a lot of different numbers 1.5 in 1 in .5 in. Also how often did you do cardio? And how often did you work out your back and abs( If you did)? Anyone else is welcome to post their results from LSJL, I would really apreciate it. After some time I will post my results also. I'm considering getting this because it honestly doesn't look like a scam but im still hesitant. ....Is that a good thing for the LSJL? I mean, what does all that mean? I use a table clamp and try to load the epiphysis for the femur and tibia. I also have started doing the heel bone too. I load for about 5 min as the scientists did the same with the rats in the experiment. In terms of strength, I make it snug but not overly painful. I do this twice a day-in the morning and night. I also do tapping.